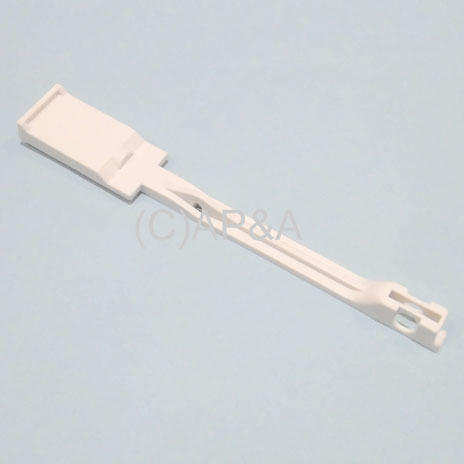 White plastic drop target, no printing/artwork. Later wide-top design used on some early electronic solid-state (SS) Bally and Bally/Midway games from approx. 1980 - 1987. Replaces Bally # A-3944, Midway #s 0017-00042-0468, AE47-00016-0000. FITMENT NOTE: This is an aftermarket replacement part that is molded with the later-style vertical spacing nub at the bottom of the target. Target ships this way by default. You may also select "without vertical spacing nub" above, when ordering, and we will remove this nub for you on each target before shipping (no extra charge). 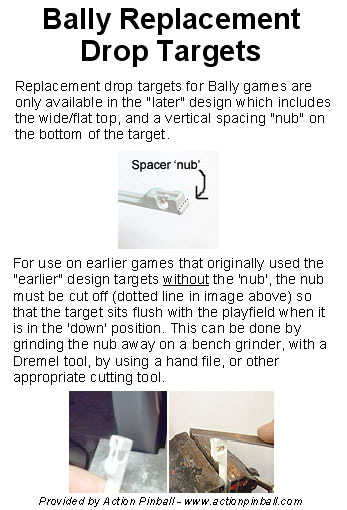 The vertical spacing nub must be cut off when using this target in games that it was originally intended for (see image below), otherwise target will sit too high when in the down position. Likewise, the nub must be left in place when using this target in games it was originally intended for, otherwise target will sit too low when in the down position. Click here for image and details.